There will be delay in the reimbursement to the CNMI of the costs incurred from hosting more than 600 illegal Chinese immigrants on Tinian after Gov. Pedro P. Tenorio asked to change some provisions of a memorandum of agreement allowing release of the federal money. Ferdinand Aranza, director of the U.S. Office of Insular Affairs, said some $950,000 have been set aside by the Immigration and Naturalization Service to pay the Commonwealth for expenditures during the Tinian operations. Noting the failure of the U.S. Immigration and Naturalization Service to protect the territorial integrity of Guam, Labor and Immigration Secretary Mark Zachares raised doubts on the capability of INS to shield the Northern Marianas from possible influx of illegal aliens if federal immigration laws were to apply here. “If the INA were to apply to the CNMI, it is inconceivable that the U.S. INS and other responsible agencies could protect the territorial integrity of the Northern Mariana Islands, a vast 14 island archipelago with over 500 times the territorial waters of Guam, from becoming a magnet for illegal immigration into the United States,” said Zachares in a letter to U.S. Senator Frank Murkowski. Following a big event on Guam that unveiled the newest fleet of Continental Micronesia aircraft, Gov. Pedro P. Tenorio yesterday urged the air carrier to do the same in the CNMI to show its commitment in the region. Dozens of media from the Philippines, CNMI, Japan, Hawaii and other island nations in the Western Pacific were flown to Guam to take part in the event to welcome the first two of nine Boeing 737 jets the airlines have acquired to upgrade its fleet. Three years from now, unless a major new industry establishes itself in the Commonwealth or a major expansion happens in the tourism sector, the CNMI expects its General Fund revenue to plummet from $245 million to a heart-stopping $193 million. 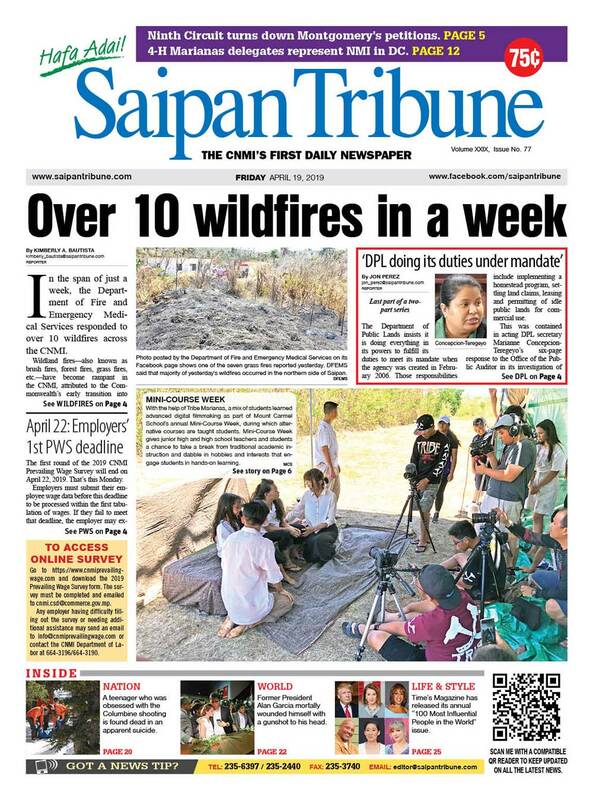 This was disclosed by Finance Secretary Lucy Nielsen, who said the CNMI may be in for some serious problems in the future, even as its economy remains in a stupor arising from the terrorist attacks in the US mainland. The Commonwealth Ports Authority Board of Directors voted to extend the implementation of the Airline Incentive Program until 2002, in light of the looming aviation crisis brought on by the Sept. 11 terrorist attacked on the US. The extension automatically delays the implementation of the new and higher landing fees, which were originally scheduled to be enforced beginning today. A major restructuring looms at the CNMI judiciary, as Supreme Court Chief Justice Miguel S. Demapan created six committees that will examine its operational efficiency in the light of the economic crisis that has been aggravated by terrorist attacks on New York and Washington. It was not clear yet if the judiciary will cut down its work force. The chief justice gave the committees until December 1 to submit their respective recommendations. Although no casualties or injuries were reported, Typhoon Higos caused extensive crop damage in the northern islands of Agrigan and Alamagan over the weekend, leaving residents with severely limited food supplies. Holders of valid U.S. visas face tighter screening upon entering the United States under a new Immigration and Naturalization Service order, which expands the categories of foreigners that have to register when applying for admissions at an American port of entry. Originally, only nationals from Iran, Iraq, Sudan, Libya and Syria were targeted for fingerprinting and special registration. The new order, issued by the INS Office of the Executive Associate Commissioner, now includes all aliens regardless of nationality.